Khmeli suneli (also spelled chmeli suneli, xmeli suneli, or hmeli suneli, from Georgian ხმელი სუნელი, literally "dried spices") is a traditional Georgian spicy herbs mixture. It is popular in Georgia and entire Caucasus region. 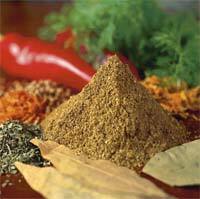 Among the herbs and spices used in khmeli suneli are: coriander, dill, basil, bay leaf, marjoram, fenugreek, parsley, safflower or saffron, black pepper, celery, thyme, hyssop, mint, and hot pepper. This mixture is an ingredient of traditional Georgian dishes and sauces, such as satsivi.